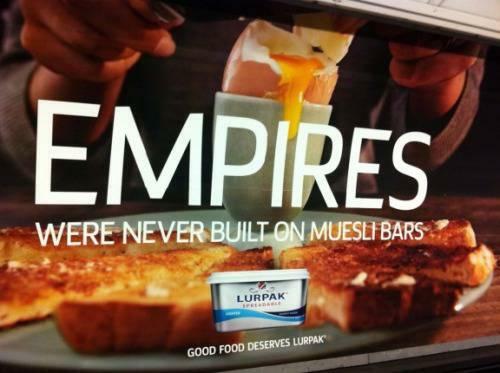 Lurpak get your big, dangerous, stupid adverts out of my face and stick to selling your Danish butter to the Danes. 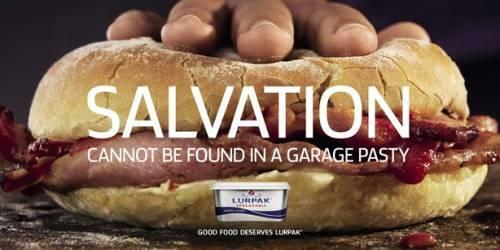 These days I cannot cycle across London without giant advertizing  boards getting up in my grill, hawking Lurpak butter. The posters shamelessly try to link a mass butter product with the complex and rich well-being benefits of cooking. Be happy, buy Lurpak and cook. The one problem with this cheery narrative is that Lurpak butter  is shipped across a sea to get here releasing unnecessary and dangerous green house gasses into our unbalanced atmosphere. Why are we creating this risk when we have great local butter, produced skillfully within these lands? The only butter I will buy is local butter. 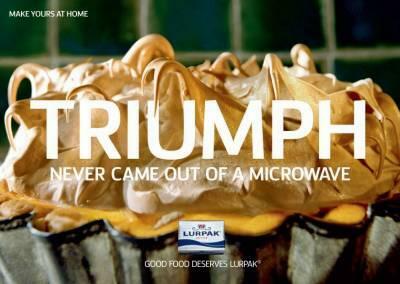 So Lurpak get your big, dangerous, stupid adverts out of my face and stick to selling your Danish butter to the Danes.